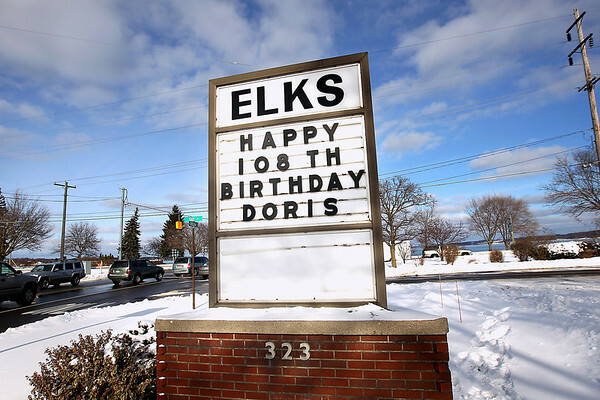 A sign displays a happy-birthday message for Doris Brackett Saturday, January 21, 2012 during Brackett's birthday celebration lunch at the Traverse City Elks Lodge which was attended by family members and close friends. Brackett turned 108-years-old on Friday, January 20. She was born on January 20, 1904 in Monroe County, Michigan. She is a huge fan of the Detroit Red Wings and Detroit Tigers and enjoys crossword puzzles. Brackett worked in accounting for a bit and volunteered at the Traverse City Convention and Visitors Bureau until she was 100. "She's still a whiz with numbers; she won't use a calculator," Chuck Ellibee, Brackett's grandson-in-law, said. When the Detroit Red Wings play a game on the west coast, Brackett will take a nap so that she's able to stay up later and watch the game. Brackett attributes her longevity to "being around good people and having good friends."